NASA isstill hoping to launch the shuttle Endeavour in early February as engineersscramble to repair broken hoses on the new space station module set to rideaboard the orbiter. Endeavouris slated to launch the new Tranquility module to the International SpaceStation on Sunday, Feb. 7 from the Kennedy Space Center in Cape Canaveral, Fla. But two of the module?s four ammonia coolant hoses have failed standard pre-launchchecks, prompting engineers to come up with a repairplan while others try to build new hoses from scratch, station managerssaid Monday. ?Folks areworking really hard to get the hoses checked out, completed, certified [and]tested,? said Pete Hasbrook, NASA manager for the Expedition 22 mission aboardthe space station. ?We are still working toward the Feb. 7 launch date.? The newTranquility module, like other space station rooms, uses liquid ammonia to keep its computers and other electronic equipment cool in space. The coolanthoses are routed on the exterior of the space station and must function at apressure of 3,000 psi to keep the ammonia supply liquid and moving, Hasbrooksaid. But the twobroken coolant hoses on Tranquility failed at a pressure of only 1,500 psi orso, apparently due to a defect in the exterior braided-metal sheath coveringthe flexible hose, Hasbrook said. The metal braids began separating from thehose connector during the test, he added. 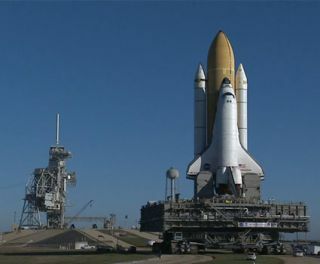 The testwas performed in Florida where the shuttleEndeavour is waiting atop its seaside launch pad for the delivery ofTranquility, a seven-window observatory port called the Cupola and othersupplies to be launched to the station. Tranquilitywas initially slated to be attached to an Earth-facing berth on the station?smain Unity connecting node, but the misalignment of ammonia coolant lines onthat node led managers to move the new module to an open berth on Unity?s port? or left ? side. To attach Tranquility there, engineers built the four?jumper? lines to route liquid ammonia from Unity to the new module. Thehoses are custom-made and are 14 feet (4.2 meters) long ? longer than typicalstation hoses. ?We haven?tused anything that long before,? station flight director David Korth toldreporters. ?So that may be a contributing factor.? Hasbrooksaid station engineers have successfully tested a ?beefed up? version of thecoolant hoses using an extra layer of braided metal in Florida, though thefinal approval on the repair is still under review. Meanwhile, another team atthe Marshall Space Flight Center in Huntsville, Ala., is working to modifyspare station hoses to replace the damaged ones in case they don?t pass muster,he added. Stillanother option is to launch Endeavourand the Tranquility module as planned, but to delay the space room?s fullactivation until March or later, when new hoses could be launched on adifferent shuttle flight, Hasbrook said. That optionwould require spacewalking astronauts to install extra heaters on Tranquilitythat would allow astronauts to install the module and power up some systemstemporarily. The module would feel more like a dark, cool cellar until the newhoses arrive later and allow for the full activation, Hasbrook said. ?That?sabout a Plan C,? he added. ?The other two options are looking pretty good.? Endeavour?sSTS-130 mission will mark first of NASA?s five finalshuttle missions scheduled to fly this year. The agency plans to retire itsthree space shuttles in the fall to make way for their replacement ? the Orioncapsules and their Ares rockets. Those newvehicles are expected to be ready to launch astronauts into space no earlierthan 2015, and possibly later, experts have said. This week,the astronauts living aboard the International Space Station plan to movea huge shelf of spare parts from one end of the outpost to the other using arobotic arm. The space station is currently home to five people: two Americans, two Russians and a Japanese astronaut. On Thursday, two Russian cosmonauts also plan to perform a six-hour spacewalk to work on a new science module called Poisk and activate itsdocking port.